When Bill Babbitt realizes his brother Manny has committed a crime, he agonizes over his decision – should he call the police? 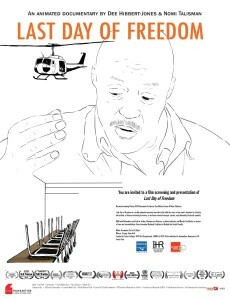 In this Academy Award nominated documentary (Short Program), LAST DAY OF FREEDOM a richly animated personal narrative unfolds as a story of Bill’s decision to stand by his brother in the face of war, crime and capital punishment. LAST DAY OF FREEDOM is a portrait of a man at the nexus of the most pressing social issues of our day, veterans’ care, mental health access and criminal justice. Created from over 32,000 hand-drawn images, the film has garnered international film and art attention and has won numerous awards since its premiere at the 2015 Full Frame Film Festival. First time filmmakers Dee Hibbert-Jones & Nomi Talisman have been working together since 2004, collaborating on art, film and interactive projects that look at the ways power structures and politics impact everyday lives. Dee is originally from the U.K., and is an Associate Professor of Art & New Media at UC Santa Cruz; Nomi was born in Israel and is a freelance editor and animator. They join us to talk about a brother’s courage and love for his troubled sibling, as well as the cultural, social, and political issues surrounding this tragic story. This entry was posted in animation, documentary, drama, Film School interview, foreign, Indie by admin. Bookmark the permalink.